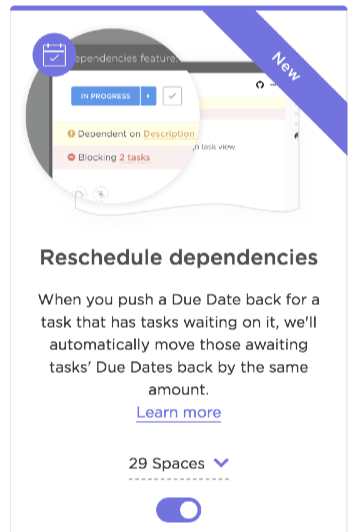 ClickUp will automatically change all tasks' Dates (both Start and Due dates) that are dependent (waiting on) a task when the blocking task's Due Date is pushed back to a later date. Enable or disable this feature at any time from the dependencies ClickApp in your team settings page. If you don't want this feature enabled, simply turn it off! Or, if you only want it for certain Spaces but not for others, customize which Spaces have it enabled (and disabled). This is also a great place to reschedule dependencies! Enable or disable the feature on the chart. Read more here! When "Reschedule Dependencies" is enabled, dragging a task with dependencies will automatically reschedule all subsequent tasks in the chain.